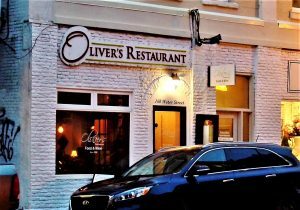 Oliver’s at 160 Water St.
Have you ever placed restaurants in summer and winter categories? I have, and I’m not talking about restaurants that are officially seasonal, ones that only operate in summer or winter. In summertime, I enjoy dining in larger restaurants with plenty of natural light. I like the buzz created by ebullient patrons. People are happier in summer, more fun to be around. In summer, I don’t mind sitting at a table in the middle of a restaurant. In winter I prefer a quiet, enclosed booth in a corner. Oliver’s, at 160 Water St., is the kind of restaurant I like to dine at in winter. It’s small and cozy. The lighting is low and intimate; most of the tables are in booths, providing physical separation between you and other diners. Psychologically, a walled booth may represent protection from the elements, or, the tribulations that tend to thrive in winter. As we approached Oliver’s, the restaurant’s white sidewalk sign caught my eye. It may have been the cold weather and my appetite for something hot and substantial, but “beef short ribs” got filed away as an entrée possibility. 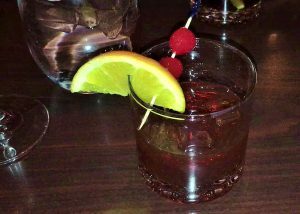 A Manhattan, the classic combination of whisky, vermouth, bitters and cherries helped whet the appetite as we made menu choices. In a jiffy, fresh, sliced bread with whipped butter – flavoured with Italian herbs – arrived to help soak up the alcohol. Two special soups had been added to the evening’s menu: tomato with parmesan, and carrot with ginger and lemon. 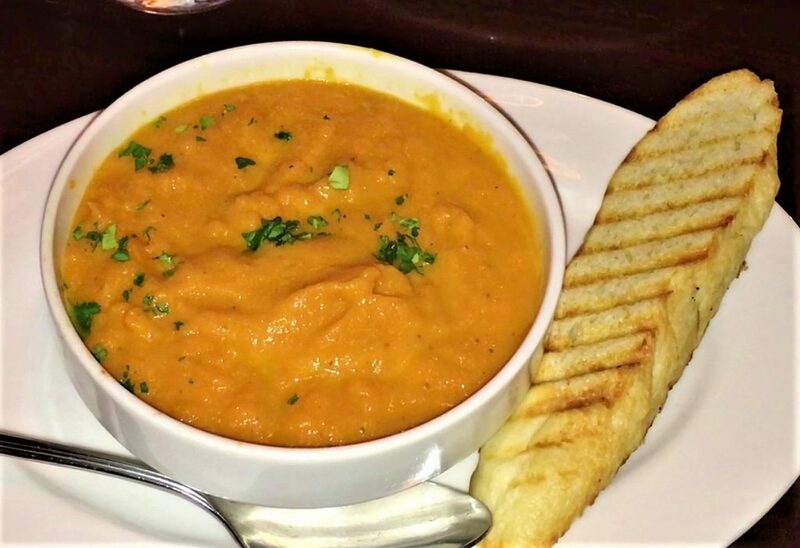 I thought the carrot soup might be thick and substantial and, above all, comforting on a frigid night. It looked a bit like carrot pudding. That’s how thick it was. The soup had concentrated carrot flavour, but the ginger and lemon were able to cut through and give it even more life. 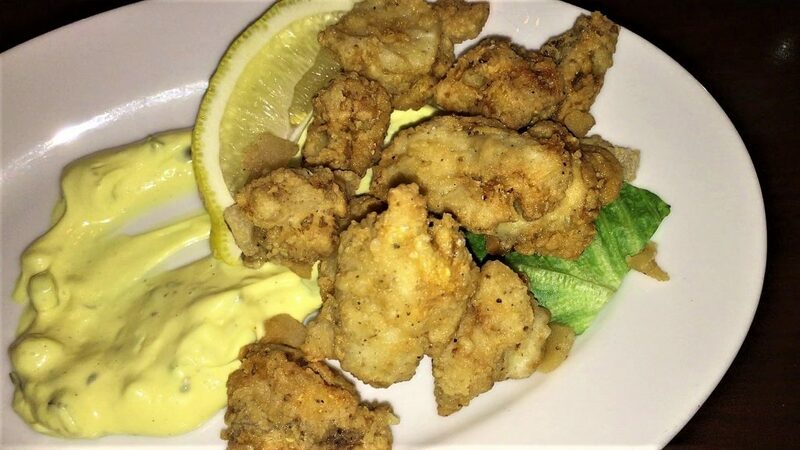 A tangy, creamy mayo accompanied Oliver’s small plate of floured, fried cod tongues and scrunchions. Cod tongue eaters fall into two camps, the people who like them small and the people who prefer large, substantial tongues. I like both. Oliver’s served smallish tongues, crisp and delicious. Spouse found them a little salty, which became a theme for the remainder of the night. 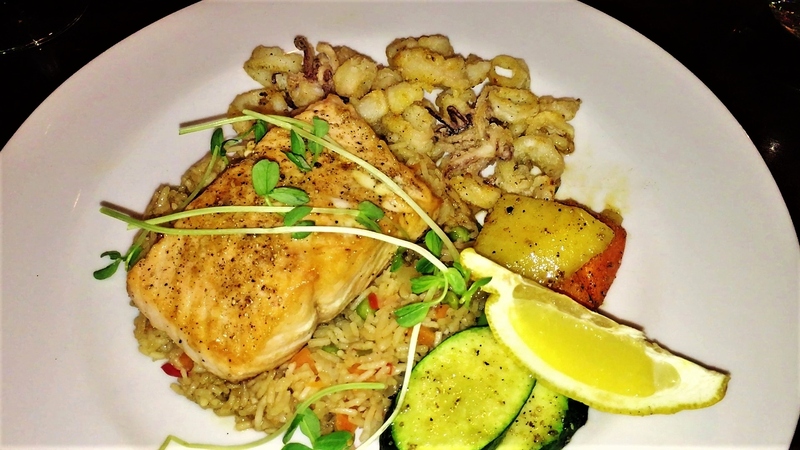 Rice and peas supported a cutlet of seasoned, honey glazed salmon served with fried calamari, zucchini and root vegetables. The salmon was fresh and cooked until firm, although not overcooked. Oliver’s did a fine job with the vegetables. Each vegetable was cooked just long enough, retaining good flavour and texture. Adding tender calamari made the dish an impressive entrée. Braising is to winter what barbecuing is to summer. Both suit the requirements of their season. Summer is a time for lighter, easy, quickly prepared meals. Winter demands substantial, heavier, deeply flavourful dishes. 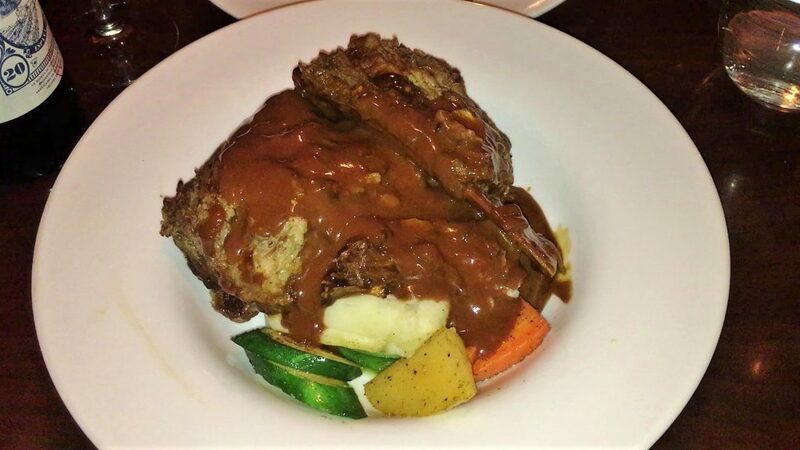 Oliver’s braised beef short ribs with red wine and porcini demi glaze was such a winter dish. The meat was beautifully cooked. It slid from the long bones with ease. The sauce was rich and earthy. More root vegetables accompanied the ribs, as well as creamed potato. Oliver’s current chef, DJ Lamb, has worked there for several years. Like all of Oliver’s previous chefs, he is very skilled and focused on consistently preparing dishes of quality. 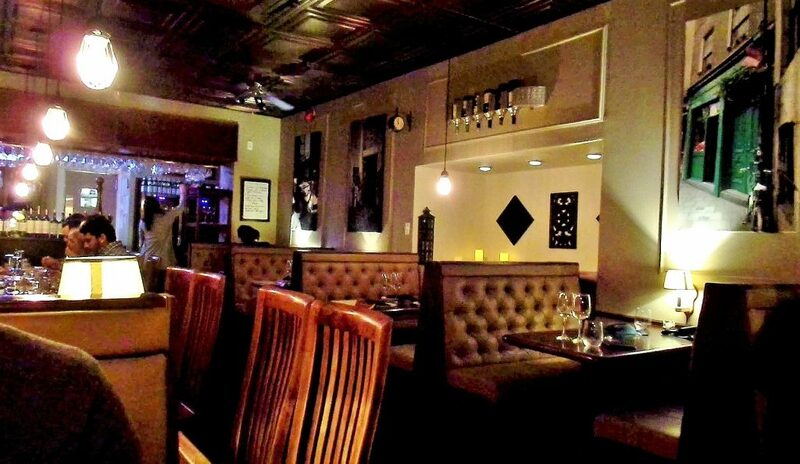 Excellent food is a main reason for Oliver’s success and why the restaurant has lasted. This year Oliver’s is celebrating 19 years in business. It’s a sure bet that if owner, Cal Vincent, wants to keep Oliver’s going for 19 or 20 more, it can go the distance. Price Dinner for two with cocktails, bottle of wine, tax and tip costs approximately $200. Open Monday to Friday: 11:30 a.m. to 10 p.m. Saturday and Sunday: 10:30 a.m. to 10 p.m. Beverages Oliver’s sells wine at $9 or $10 per 5 oz glass, $14 or $16 per 9 oz glass, $27 or $29 per half-litre, $44 or $49 per litre, and Villa Sandi Prosecco at $8 per glass or $35 per bottle. A compact group of drinkable wines from around the world is available for $40 to $75 per bottle. A short list of special selection wines includes Campo Eliseo Blanco 2013 Verdejo (Spain) at $85 and Olivier Laflaive Monthelie Premier Cru 2009 (France) at $82. Quality champagnes include the highly prized and highly priced Dom Perignon at $325 per bottle and Veuve Clicquot at $109. Oliver’s sells classic cocktails, house created cocktails, imported and domestic beers and cider. There’s also a list of bourbons and scotches, including Blanton’s Original Style Single Barrel Bourbon, Knob Creek 9 Year Kentucky Bourbon, Auchentoshan Three Wood Scotch and The Macallan 1824 Gold Scotch. Best bets Braised or slow cooked meats. Gluten free options Please ask server for details.